Home » News » Truck Night is still on tonight! ANNOUNCEMENT: Truck Night is still on tonight! 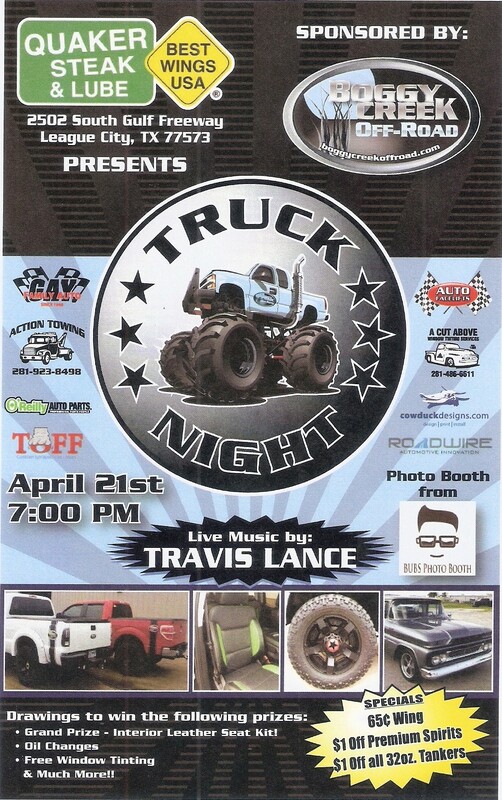 However, due to the extreme weather conditions we have been experiencing this week in the Houston and surrounding areas that has affected so many of our Boggy Creek family and friends, we will be having a very laid back Truck Night event. We will still have music by the AMAZING Travis Lance, DELICIOUS food & drink specials from Quaker Steak & Lube, and a great night of FUN! However, we are rescheduling our prize raffles, but will still be handing out Boggy Creek koozies and T-Shirts! Please keep an eye on the Boggy Creek, Auto Facelift, and Quaker Steak & Lube pages for further updates! Thank you for your patience and understanding during this time, and we LOVE our Boggy Creek family!! !